Pumpkin is a versatile vegetable which can be cooked in many ways. You can fry it, make cakes out of it, steam it or even bake a cake with it. One way of savouring the delicious sweet-tasting pumpkin is to cook it with rice in a rice cooker or claypot over charcoal fire (if you have one). You can also cook it in a pot over a gas stove or electric burner but care is needed to prevent burning. Pumpkin rice ensures that every taste of the pumpkin is fully absorbed by the rice and the use of other ingredients like dried prawns, mushrooms and belly pork makes this dish a truly satisfying dish to make and eat. You donâ€™t really have to cook anything else as you get your share of carbohydrate, protein, fat and fibre all in one dish. If you like pumpkins, you should try this. Fry shallots in oil till golden brown. Remove fried shallots and set aside. Remove oil separately into a bowl. Bring a pot of water to boil and add belly pork. As the water starts reboiling, remove scum from surface till no more scum appears. Remove pork and allow to cool. Cut the pork into small pieces (just like the mushroom strips), retaining the fat. Heat up 2 tablespoons of the shallot oil. Add pre-soaked mushrooms and stir fry for 2 minutes. Add pre-soaked dried prawns. Continue stir-frying for another 2 minutes or so till aromatic. Add belly pork strips and stir well for about 2 minutes. Next, add pumpkin and continue stirring for another 2 minutes. Add a little shallot oil if combined ingredients are drying up. Add pre-soaked rice followed by seasoning and stir till ingredients are mixed well. If you are cooking in the pot / wok, add water to cover the rice mixture, reduce heat to low, cover and allow it to cook slowly, stirring occasionally to prevent burning. Cook till rice is fully cooked. Serve with a sprinkle of fried shallots. Miss B : I’m glad you’re doing well with the recipes. Thanks for your feedback! Hi, may I know what’s the calorie count for pumpkin rice? I’m trying to watch my weight and I love it (i followed your recipe and it works!) but I just want to know how often I can eat it. Thanks! Maureen : Thank you for trying out the recipe. I’m afraid I have no idea about the calorie count as home-styled cooking in general does not involve taking precise measurements for calorie counts. Simply delicious! 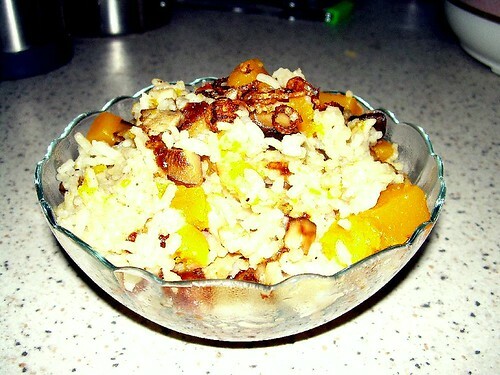 Thanks alot for sharing ur pumpkin rice recipe! It’s pretty easy. And most importantly, my hubby loves it to the core…??? ?